Adding another feather to the cap, The Sanskaar Valley School has been bestowed with yet another accolade. 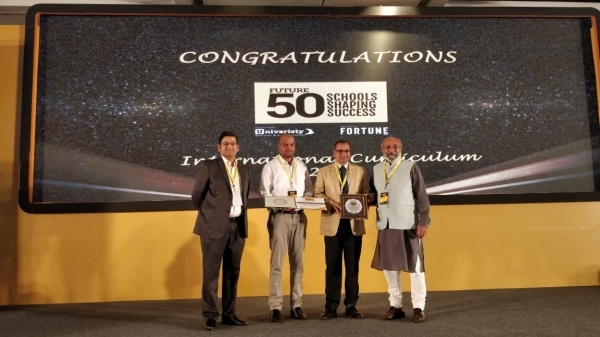 TSVS has made it to the list of Top 50 Schools and has been recognized as 'Future 50 Schools Shaping Success', under the International Curriculum Category for the year 2018. The school has achieved this feat second time in a row. This award has been endorsed by Forbes India and the selection into this elite category of schools is the result of a comprehensive survey undertaken by Forbes on several parameters instrumental in the running and administration of curriculum. On behalf of the school, Dr. Dillip K. Panda, Dean of Studies-TSVS received the award. The award was handed over at a glittering ceremony that took place on 14th November 2018 at Hotel Sahara Star, Mumbai in the presence of representatives from other schools as well.